San Francisco (CNN Business) Verizon has pulled ahead in the US race to launch 5G, the next generation of ultra-fast wireless connections. On Wednesday, the carrier became the first to launch a 5G network and a smartphone that works on it. The network is now available to customers in select areas of Chicago and Minneapolis. But the catch is they’ll need the $240 moto z3 — the first 5G-enabled smartphone to hit the US market — to access the network. The device requires the $200 5G moto mod attachment, which resembles a small battery back, that enables the phone to connect to the network. Verizon and AT&T have already launched 5G networks in several US cities, but Chicago and Minneapolis are the first locations where people can access the networks with a 5G device. 5G technology has been touted as a major breakthrough that will allow for better video streaming and more technical advancements such as powering self-driving cars. 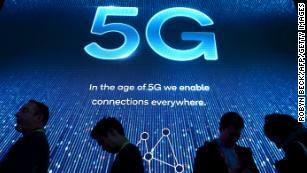 Who’s winning the 5G race? Verizon launched the first commercial broadband 5G service last October. It’s also set to be the first US carrier to get the Samsung Galaxy S10 5G, a smartphone that won’t require an attachment to access 5G. It is expected to hit stores later this spring in the US. The launch was a week ahead of schedule. It comes on the heels of a report from the Cellular Telecommunications Industry Association (CTIA), which represents the US wireless communications industry, that claimed that the United States and China are tied for first place in 5G readiness. South Korea, which came in third in the report, was expected to launch the first 5G device on a 5G network with the Samsung Galaxy S10 5G this Friday. In Chicago, 5G coverage is concentrated in areas including the West Loop and South Loop and around landmarks such as Union Station, Willis Tower and Millennium Park. In Minneapolis, service is concentrated downtown and inside the US Bank Stadium, the site of this weekend’s NCAA men’s basketball Final Four games. Although 5G innovation is already underway in the US, there still isn’t a network widespread enough to benefit the majority of wireless customers. The transition from 4G to 5G networks in the United States will be slow until 2020 and involve infrastructure upgrades that cost companies billions of dollars. It will also require lots of testing.